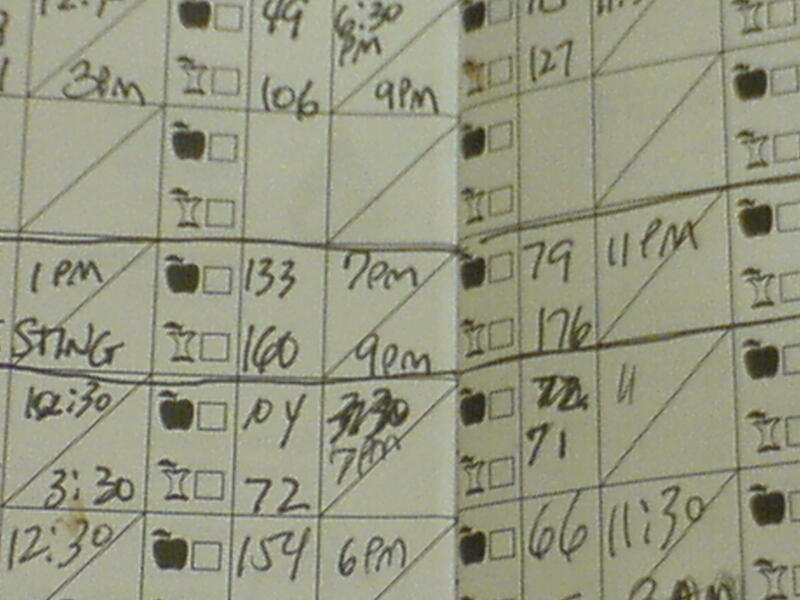 For the first time in I don’t know how long I’m keeping a log of blood sugars. No kidding, it has the blood smears throughout to prove it. The reason? Two weeks ago I started with a new endo whose main task has been adjusting my insulin dose and when I take my Lantus so I have less lows. Personally, I wasn’t particularly concerned about my once or twice a week low, and I particularly liked that my A1cs are in the 5’s, but endo said the fluctuations in blood sugar irritates the blood vessels and it would be healthier to be mainlining more around 100 and up to 140 two hours after a meal. That meant two changes: 1) Cutting down from 14 of Lantus to 10 units and 2) Switching my Lantus from before breakfast to before bed. Switching to before bed was to override the morning highs (dawn phenomenon). My sugar was rising so fast in the morning it was thought my Lantus wasn’t lasting 24 hours and by moving it to before bed I’d have better coverage for the morning. I’d been taking a first dose of Apidra by 7 AM to blunt my blood sugar rise and then a second dose for breakfast. The cutting down on the amount of Lantus I was taking was because endo thought I had too much Lantus in my system overall the 20 or so hours it is working, and it may be contributing to my lows. But cutting back to 10 units, the immediate result was HIGH blood sugars. I was freaking out. And, I had such unpredictability with my numbers that I was unexpectedly at a loss how to deal with my rapid-acting mealtime Apidra. I had had my routine sooooo down pat before this all started that this lack of control was, and is, driving me insane. So we upped my Lantus to 12 units which seems to be working a little better except for the 261 I had out of the blue after lunch the other day and the 30 that awoke me at 2 AM with my heart beating out of my chest. I’m not liking this new routine much. Can you tell? The unpredictability is driving me nuts, did I say that already? If so, it’s worth repeating. But, I have to commend my endo for checking in with me weekly to discuss my numbers and for listening to my frustration. That can’t be fun. I’m giving endo another half point. And I’m going to give this new regimen, which now includes dosing my Apidra for dinner higher since those evening hours may be when my Lantus is wearing off now, another week to see if things settle down, which I tell myself daily, hourly they will. And while I wanted to jump ship this morning and go back to my old ways, endo said let’s give it another few days and I know endo is right. I know I am biting at the chomp to cut the process short because I’m so impatient to be back in control. However, this morning endo revealed another reason to try and get my sugars to be more consistent: lows can lead to insulin resistance. Oy! One thing I can say from all this stomping around in my sugars is I see a clearer case, personally, for using a pump. To have as I’ve always described it, “more elegant control” – greater flexibility in the moment and to be able to preprogram for more and less insulin as the body needs it at various times of day. Personally, I was waiting for the pump to get small enough that it wouldn’t feel like an intrusion on my body, and it seems to have done just that with the soon-appearing-near-you Solo MicroPump. So while I’m still futzing around with my calculations I can offer you some advice from two diabetes educators I checked in with about what the ratio should be between your Lantus and rapid acting mealtime insulin if you use both. My other educator added that since I eat a low carb diet, maybe 15 grams of carb/meal at most, except for breakfast, that I shouldn’t expect my Lantus/ Apidra ratio to be 1:1 but more like 2:1. General rule for where your sugars should be: 80-100 before meals, 125-140 post meals and 120-140 before bed. My advice: Find the best match between your medicine and your blood sugars even if it takes some doing. Make it a priority – both for your diabetes health and your peace of mind.